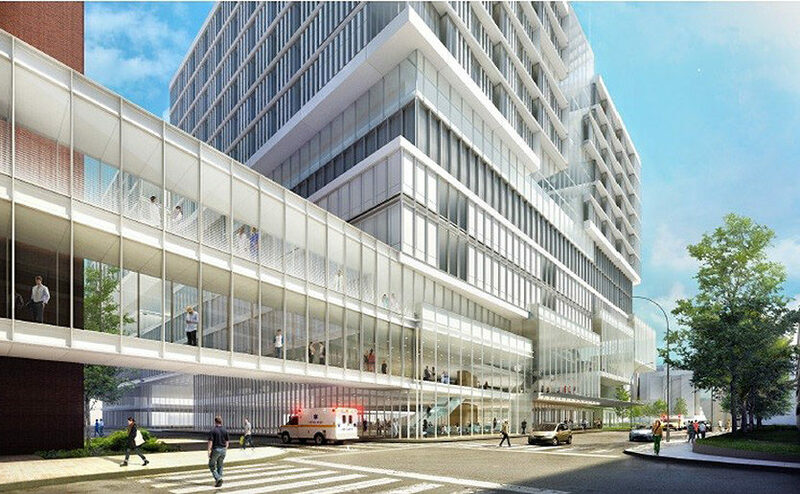 Our announcement about plans to construct a new clinical building at Massachusetts General Hospital marks a significant step in a two-centuries-old march of campus revitalization and renewal. This hospital has always been a dynamic place, expanding to accommodate growth and medical progress, incorporating the highest standards of care, and committed to providing the best possible environment for patients, families and staff. Mass General’s Bulfinch Building opened in 1821. In 1821, when the Bulfinch Building opened, it was heralded as “the finest building in the state.” At that time, fresh air, warmth, good food, cleanliness and quiet were among the limited treatments available to the sick or injured. And the Bulfinch Building offered them all. It sported four chimneys that were part of an innovative central heating system consisting of an array of flues connected to a cellar furnace. Plentiful windows let in both sunlight and breezes from the adjacent Charles River. And particularly noteworthy was a basement pump that circulated water through pipes to rudimentary flush toilets in “water closets” many decades before indoor plumbing was common. As Mass General grew and as medicine advanced, new buildings were erected and older ones came down. In the late 1930s, with adjacent land increasingly scarce, Mass General began to look skyward. Several small inpatient pavilions, an outpatient facility and an operating building were torn down, and in their place rose the majestic 13-story George Robert White Building. With its cruciform shape and bright porches, the White Building was the epitome of a modern hospital structure when it opened in 1939. It consolidated the hospital’s growing surgical program, featuring the latest in operating room technology, an x-ray suite, labs and eight inpatient floors with a combination of patient wards and patient rooms. Opened in 1939, the White Building consolidated Mass General’s growing surgical program. Eighty years later, the White Building still serves as a significant Mass General clinical facility. Today, however, the building is far from state-of-the-art. While the care delivered in White is exceptional, the environment is outmoded, inefficient and cramped. Most patient rooms are doubles, with only one shower serving the 24 inpatients per floor. Patient satisfaction scores for noise and privacy are far lower among patients in White than they are for patients in newer facilities. Contrast the inadequate space per patient in White to what is now the benchmark for patient rooms – and what we are planning to build moving forward. The Lunder Building, which opened in 2011, features five floors of all single-bed rooms, each with ample space to meet the needs – clinical, physical and emotional – of patients and families. Lunder’s environment is quiet and calm, with patient rooms featuring nice views and privacy. In addition, the building houses 28 large operating/procedural rooms, some with intraoperative MRI, CT and angiography. Lunder also provides space for part of the Emergency Department, and its lower levels are home to Radiation Oncology, featuring advanced linear accelerators and related technology. The building we are looking to construct – which will be designed by NBBJ, the architectural firm that developed the Lunder Building – would include approximately 450 single-bed inpatient rooms located on the top six floors of two parallel towers. These new rooms will enable us to decommission outmoded space in the White Building and other older facilities – including Gray-Bigelow, which opened in 1969 – and convert some double inpatient rooms into singles. The net increase would be somewhere between 100 and 200 inpatient beds. The Lunder Building opened in 2011. The size of each patient room in the new facility will be comparable to rooms in the Lunder Building, offering not only privacy but plenty of space for equipment and family members. The building will feature new operating/interventional and procedural rooms, imaging facilities, infusion rooms, exam rooms, clinical support space for pharmacy and dietary, a cafe, and retail space along Cambridge Street. Six levels of underground parking will accommodate more than 1,000 vehicles, largely replacing the Parkman Garage’s current spaces. For the thousands of Mass General staff and patients who deal every day with our significant capacity challenges, this new building can’t come soon enough. But a major construction project in a congested urban location requires a multi-step public review and approval process that will take at least 18 months. After approval, we will begin a staged construction plan that calls for phase one of the building to open in approximately four years and the second phase three years later. We initiated the formal public process in January with the delivery of the letter of intent to the Boston Planning and Development Agency. Last week, we filed a more detailed plan called the Institutional Master Plan Project Notification Form. An impact advisory group comprised of community representatives held its initial meeting this week to review plans for the project. Peter L. Slavin, MD is the president of Massachusetts General Hospital.